There’s a story that was posted yesterday on Maariv’s website that is nothing short of chilling. It seems that as part of the preparations for a possible withdrawal from Gaza, the military rabbinate is busy drawing up plans to dig up the Jewish cemetery in Gush Katif and remove the 43 graves contained there (which include those of people killed by Palestinian terrorists as well as 4 Israeli soldiers). The article also notes that the military rabbinate will not compel family members to agree to move the graves of their loved ones, but they will “recommend” such a step. The fear, of course, hardly needs to be spelled out – if a Jewish cemetery were to be left in place in Gaza after a withdrawal, one can only imagine how it would be treated by the euphoric Palestinians. 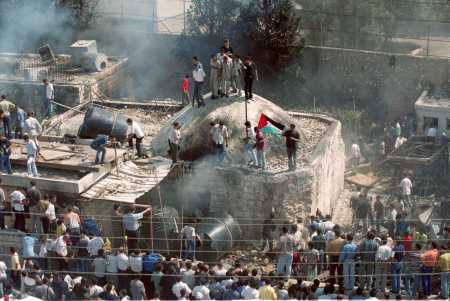 Anyone remember what they did to Joseph’s Tomb in Shechem (Nablus) in the autumn of 2000? It probably hasn’t occurred to our courageous leaders – but what does it all this say about our ostensible Palestinian partners? They won’t let us live in peace, and they won’t even let our dead rest in peace. And if that is the case, giving them still more territory from which to attack the Jewish state hardly seems like a wise move to make.